Welcome to the first edition of Friday Favorites! In this series, the blog will feature our favorite children’s books from the week. If you’re looking for more great children’s books, check out the 31 Days of Picture Books series, or click on the category for children’s books on the left of your screen. And now, let’s jump right in! Our favorite books this week are by different authors and illustrators, but have a similar look and feel. The first is Rosie’s Magic Horse. It is by the famous writer Russell Hoban of the Frances books, and illustrated by Quentin Blake, better known for his collaboration with Roald Dahl. 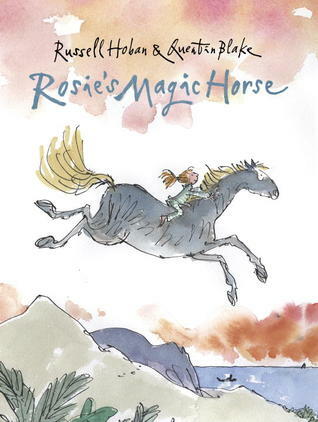 Rosie’s Magic Horse is the fanciful tale of a girl named Rosie and a box of popsicle sticks with ambition. Yes, it sounds totally strange, but it’s just plain fun. After reading it about ten times, my five-year-old daughter decided to make a “cigar box” by taping together pieces of cardboard and decorating it. It’s currently full of about 15 popsicle sticks. She keeps it by her bed. I have no idea why it’s so special to her, but it makes me smile. Maybe she’s dreaming those popsicle sticks are turning into all kinds of things while she sleeps. Apparently we’re into magic books this week, because my three-year-old son Isaac’s favorite is The Magic Bed, by John Burningham. I have mixed feelings about this book, because I can’t figure the family structure and the adults in it are rather lame. Being an adult myself, I prefer not to be painted in such a light, but I don’t think Isaac is too concerned about it at this point. He just likes the adventure of getting into a bed, figuring out a magic word, and soaring off to fight pirates and rescue lost baby tigers. Both of our favorite books of this week are on the zany, fantastical side, but my children sure do love them and we will definitely balance them out with books more rooted in reality as we go along. We sure do enjoy children’s books around here. Stay tuned for more as Friday Favorites continues each week!